Do you love books? Do you want to be surrounded by thousands of books? Do you have a knack for organizing? 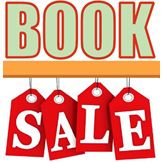 We need people to help set up our seasonal book sales by organizing by genres and authors and maintain the 2 or 3 rooms of books during each sale. Our book sales bring in more money for the library than any other fundraising event. Join our book sale team! To join our volunteer team, please fill out our volunteer application form ( http://bit.ly/2g4poF1 ) and mail/e-mail it or hand-deliver it to the library. E-mailed forms should be sent to info@kellogghubbard.org.